Home / Entertainment / Opinion / Ilocano writer, reporter hit Moira Dela Torre: Pangit ng ugali mo, halatang hilaw at bastos"
Ilocano writer, reporter hit Moira Dela Torre: Pangit ng ugali mo, halatang hilaw at bastos"
Moira Dela Torre is now under fire for an Anti-Marcos tweet she just released after a concert in Ilocos for late President Marcos’ 101st birthday. Netizens, particularly Ilocanos throw their ire on Moira as the latter posted offensive tweets against Marcos. In lieu of such issue, other matter and behind the scenes “bad attitude” went disclosed. Several netizens posted their share of sentiments on how the popular singer revealed her feeling-superstar-actions. 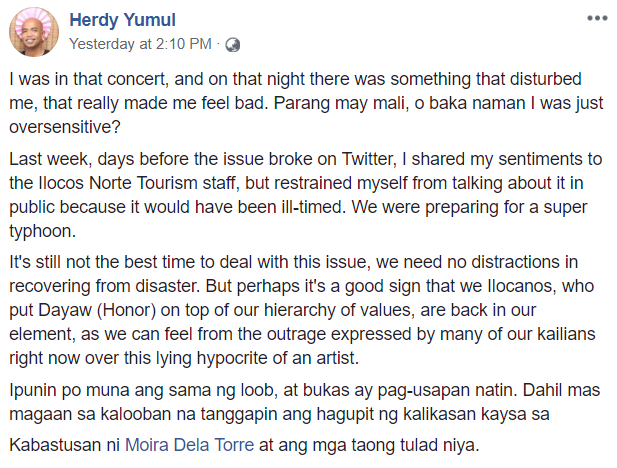 Herdy Yumul, an Ilocano writer and one of the those Ilocanos who attended the concert night shared that he felt something wrong with the event. Despite having strange feelings, he brushes off the idea thinking that he was just being oversensitive. Yumul claims that it is not the best time to put the rage on Moira as Ilocanos put their honor first as typhoon Ompong just left Ilocos, leaving the region devastated. Moreover, the man set a date for a Facebook live to discuss and air their sentiments against the singer. 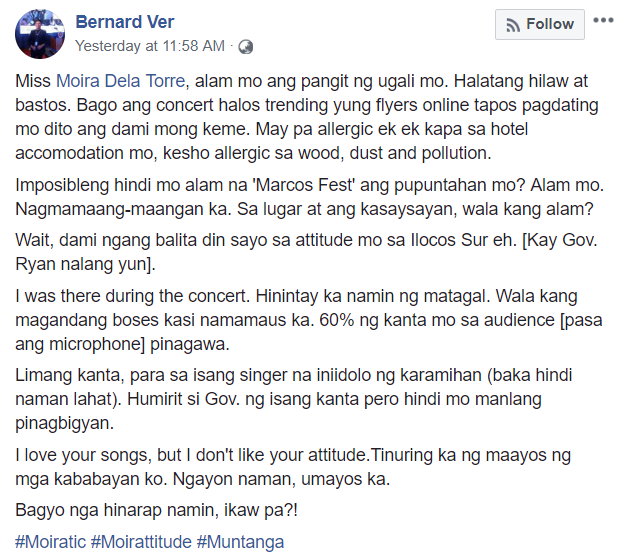 Issues on Moira’s bad attitude went disclosed when mad Ilocanos divulge how the songwriter demands to be treated more like a royalty during her stay in the hotel. The singer claims that she has allergies to dust and woods so she was being taken care of by the producers. Added to that, the hit hugot singer had a cranky voice, obviously not giving her best performance thus giving the audience the mic to fill in instead of her. Here's a post of Bernard Ver, an Ilocano news reporter. 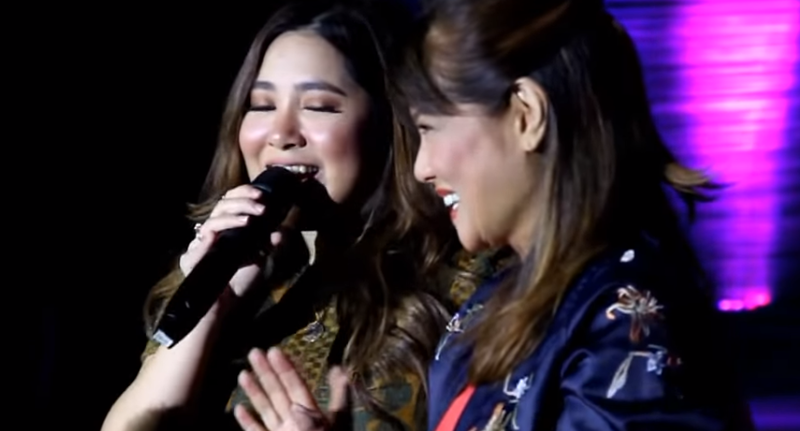 Branded as a liar hypocrite, netizens also claim that the singer was not deceived that she will sing in Marcos Fest, adverse from Moira’s claims. From Laoag airport, flyers are all over the place so no way of deceiving her and just get her to Ilocos and perform. She didn’t give the chance for an extra song as plead by the Ilocos Governor, which most find as rude. But then, Moira must be lucky to have been treated well by the Ilocanos as she and her songs are greatly admired despite showing her bad side to them. Netizens sympathize to Ilocanos on this matter. Some are turning their backs on the singer due to the event. Some claims that the singer’s career will soon fall with her bad attitude. One netizen replied on Herdy’s post suggesting that Moira should be put persona non grata in the whole Ilocos Region.